So I finally got this board back from my ding guy last night. Picked it up a couple months ago already damaged from a fellow jamboarder. I believe he purchased it from another guy here. It says "For Darren" on the stringer. It also has the serial number "HI-30" or "HI-31"... i've forgotten already. Wondering about the "HI" in the serial number and the word "Hawaii" on the fins. Anyone here know the significance of that, if any? This board was purchased in the San Diego area, not in Hawaii. Surfed it this morning in less than stellar conditions. The board was fun, but the waves weren't worthy of a true ride report. edit : i think it is a 6'9". i didn't measure and no dims on the board. would be a center fin on a 2+1 egg. Anybody have one they don't use? This guy tells it like it is. Substitute "cycling" with "surfing." 9.5 out of 10 condition EC Los Once for $600. Mid-weight blank with volan. No damage or repairs. One or two heel dents. Considering an Action Cam - For mostly water use - Surf, Snorkeling/Diving, kayaking, etc... Is there anything out there worth considering outside of a Go Pro? Probably don't need anything water proof below 60ft at this point. Will be used most at the surface and a little ways below. Videos, and the occasional still would be nice. What are some thoughts from the Jammers? Picked up a 9'8 CJ/City Fog 'Mars' Noserider...what fin? Grabbed one from a buddy recently and got a 10" Tudor fin with it.Haven't tried it out yet, but wondering what fin you all would recommendfor this design? I'll only surf it in small/tiny peelers, with an emphasis on tip time morethan any turning. Cheers! What do you ride when it's steep and gnarly? I ride my longboards and fishes 95 percent of the time,and it's all about slide and glide. Every now and then i'll hit a heavier reef or beach break on a big day and those boards have two problems: duck diving and making a steep and critical drop. For those days I have a 7'0 Kies hybrid. I can get out, catch just about anything, and if I can get to my feet I'll probably make it. Only thing I don't like about this board is all the nose rocker. If it's not steep and gnarly then it just seems to stall out and I put it away. So those in between days I can never decide which to bring. My buddy wants to buy it off me so I'm wondering what I'd get instead. Sorry don't have a pic as it's out on loan. It's the standard Kies double wing swallow hybrid with a narrow nose. 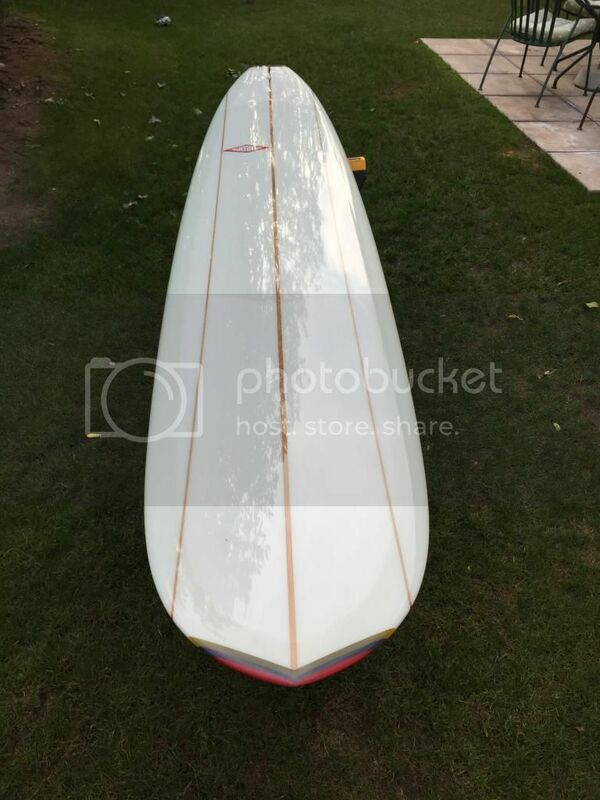 Looking to sell or trade this sweet 9'2" Jacobs 422 noserider. No dims on board, but I measured: 9'2" X 22 3/4 X 16.5T X 18N X 3ish. 20.2 pounds. 8/10 condition, some deck pressures, a tiny sealed nose ding and two light rail shatters. White tinted class job with white opaque comp band/dot and double stringers. Beautiful board. Pic is off web, but the exact board. Stripped of wax and ready to go. Why am I selling? I decided I like subtle concave and less tail kick. This board has a deep, defined nose concave and alot of tail kick. Would consider trades for a quality midlength or maybe something else interesting in similar condition: Mabile, Andreini, Christenson, Hilbers etc.